The legendary starfleet captain is setting a course for CBS All Access. According to a report by Deadline, Patrick Stewart will star in a new Star Trek series for the CBS All Access streaming service. The actor will be reprising his iconic role of Jean-Luc Picard from Star Trek: The Next Generation. The news comes from the 2018 Official Star Trek Convention in Las Vegas, where Stewart made a surprise appearance to make the announcement himself. The currently untitled Star Trek series is being developed for CBS All Access by Alex Kurtzman, the co-creator and executive producer of Star Trek: Discovery. Though full plot details have not been revealed yet, the new show won't be a reboot of Star Trek: The Next Generation. Instead, the series will explore the next stage in Picard's life. Check out the announcement video with Patrick Stewart below! "With overwhelming joy, it's a privilege to welcome Sir Patrick Stewart back to the Star Trek fold," said Alex Kurtzman. "For over 20 years, fans have hoped for the return of Captain Jean-Luc Picard and that day is finally here. We can't wait to forge new ground, surprise people, and honor generations both new and old." Other members of the show's creative team will include James Duff, Akiva Goldsman, Michael Chabon, and Kirsten Beyer. In addition, Stewart, Chabon, Goldsman, Duff, and Kurtzman will executive produce, along with Heather Kadin of Secret Hideout, Roddenberry Entertainment President Eugene "Rod" Roddenberry, and Roddenberry Entertainment COO Trevor Roth. "I will always be very proud to have been a part of Star Trek: The Next Generation, but when we wrapped that final movie in the spring of 2002, I truly felt my time with Star Trek had run its natural course," said Stewart. "It is, therefore, an unexpected but delightful surprise to find myself excited and invigorated to be returning to Jean-Luc Picard and to explore new dimensions within him. Seeking out new life for him, when I thought that life was over. During these past years, it has been humbling to hear many stories about how The Next Generation brought people comfort, saw them through difficult periods in their lives or how the example of Jean-Luc inspired so many to follow in his footsteps, pursuing science, exploration and leadership. I feel I'm ready to return to him for the same reason -- to research and experience what comforting and reforming light he might shine on these often very dark times. I look forward to working with our brilliant creative team as we endeavor to bring a fresh, unexpected and pertinent story to life once more." Patrick Stewart originally played Captain Jean-Luc Picard in all seven seasons of Star Trek: The Next Generation, which ran from 1987 to 1994. In addition, the actor previously reprised the role in four theatrical films: Star Trek: Generations (1994), Star Trek: First Contact (1996), Star Trek: Insurrection (1998), and Star Trek: Nemesis (2002). 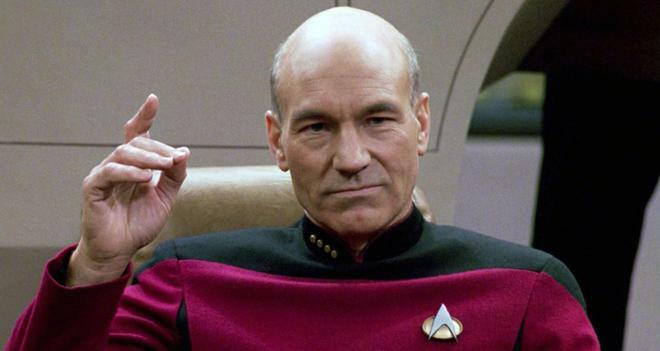 An exact release date for the new Star Trek show has not been announced yet. Beyond the upcoming series, CBS All Access is also home to Star Trek: Discovery which is set to return for a second season in early 2019. A current CBS All Access subscription costs $5.99 per month with reduced commercials or $9.99 per month for a commercial-free plan.